The Korta Katarina (KK) Southern Croatian winery and its villa "Rivijera Orebić" (or-ub-itch) are a winelovers dream. The first venue of its kind in Southern Croatia, the winery, villa and vineyards are perched on the edge of the crystal-clear Adriatic Sea and provide breathtaking views of Croatia's Dalmatian Coast. We offer Dalmatian wine tours of the area. Considered one of the most stunning coastlines in the world, the Dalmation Coasts Dingač (ding-gatch) and Postup regions of the Pelješac (pell-yuh-shotz) Peninsula and the region of Cara (cha-ra), on the Island of Korcula (kor-chu-la), produce Korta Katarina's award winning Plavac Mali, (plah-vahtz mah-lee) Reuben's Reserve Plavac Mali, Posip (po-ship) and Rose wines. The estate is located in the small coastal town of Orebić (or-ub-itch), a region renowned for its culture, seaports and winemaking traditions that date back to the Roman Empire. For centuries, 'kortas' were the center of family gatherings for sea captains and sailors embarking on worldly adventures. 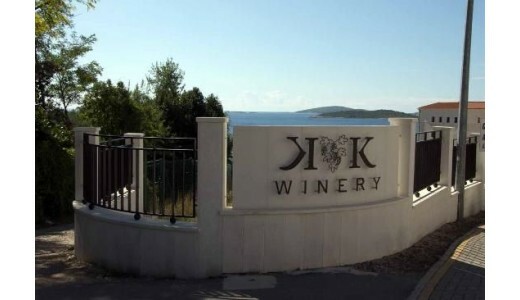 The KORTA KATARINA winery name represents the kortas/gardens of Croatia and the family name Katarina/Katharine of KK founders and owners Lee and Penny Anderson. The Andersons and Korta Katarina invite you to explore the culture, vineyards, winemaking traditions and state of the art winery at Korta Katrina, and experience the winemaking renaissance that is underway in Croatia and reflected in the wines of the KORTA KATARINA portfolio. Lively, full and almost opaque ruby color. It is full-bodied and it has a recognizable varietal arom..
Golden-greenish color in the glass provides an appealing appearance of this pošip wine. It has an in..